and his determination of plagiarism by author Richard Condon in The Manchurian Candidate. Hardcover version of Da Vinci Code. available when the analysis was conducted, not the 2004 re-issue). Softcover of Daughter of God. The reader will be aware that the controversy to be addressed in this document is not only about Dan Brown's The Da Vinci Code (hereafter DVC) with respect to Lewis Perdue's Daughter of God (hereafter DoG), but also between Brown's book, DVC, and Perdue's two earlier books, The Linz Testament (hereafter Linz) and The Da Vinci Legacy (hereafter DVL). The first of these, DVL, was published in 1983, followed by Linz in 1985, with DoG published in 2000. Essentially, each novel has built on its predecessor. In DVL Perdue began by exploring the topic of Leonardo da Vinci and religion in a thriller format, but later felt that to this theme should be added that of exploring the notion of 'the lost feminine' in modern day religions — having concluded that DVL had not succeeded in quite the way he wanted (though the book itself was very successful). So, in writing Linz, the second book of this genre, he kept some character types, almost began the narrative from scratch, and then expanded the religious history aspect which was what had begun to engage his interest at that time. Also, he was on the lookout for a different kind of heroine: in DVL the heroine is rescued by the hero, but by the time we get to Linz the heroine is the one doing the rescuing. This plot line goes a step further in DoG, because here the heroine rescues herself. There are many other refinements, to do with the characterisation overall, and the plot lines themselves. It is also true to say that in his researches— now spanning over 20 years — Perdue has accumulated a not inconsiderable knowledge of certain aspects of religion and art. Interestingly, as he would be the first to admit, he has also probably acquired some quite erroneous impressions and/or facts. Curiously, one of these errors (there may be others) was repeated by Brown in DVC, the kind of material error of fact that probably could have only one source, namely Perdue's books themselves. Moreover, as shall be seen later in this analysis, the error is quite central to the story, since it relates to a significant feature of the narrative of Perdue's books, and later Brown's. Therefore, it is important to realize that — despite the existence of many points of striking similarity between the later and earlier books by Perdue — the later books are not mere reworkings of the earlier ones, but major developments, not only in terms of characterisation and plot but also in terms of the underlying infrastructure of facts and knowledge, although there are of necessity many points of striking similarity between the later and earlier books. As outlined in the previous section, the claim is not just that Brown plagiarized from DoG, but also from DVL and Linz. That is the purpose of this analysis: to demonstrate substantial infringement by Daniel Brown of Lewis Perdue's three books DVL (Da Vinci Legacy), Linz (The Linz Testament) and DoG (Daughter of God). The reader will appreciate that of necessity it would be impossible in this document to catalogue each and every alleged plagiary. Rather, the intention is to give the reader a general introduction to the nature and extent of these infringements. Several plot lines run through Perdue's original Daughter of God/Da Vinci Legacy books, and many of these are strikingly similar or even identical in Brown's later Da Vinci Code. One set of examples concerns the way in which the hero becomes involved in the quest to locate the documents which contain secrets so dangerous and 'explosive' that members of various religious sects are prepared to kill to conceal them. The documents, in each author's work, contain explosive secrets, and a quest to find them is launched when a renowned international expert is murdered by a member of a religious sect. Co-incidentally (?) in each book the expert is the 4th person within his area of expertise to be killed in this way (not the 2nd, 3rd or 5th, but in each case, the 4th). As it happens the hero and the expert in each author's work are actually acquainted with each other. The murdered expert in each author's work writes a last message in his own blood, and — finally — the hero, in each author's work, is accused of the murder of the expert. More details are shown in the graph below, where each bar relates to the page number in the respective book where the relevant detail is mentioned. As the reader will observe, there are seven plot features — which I believe to be representative of the striking similarities across the books in general — mentioned in the description above, and shown in the graph below — six of these seven plot features are in sequence and on very similar page numbers within the overall books. So, for example the existence of the secret documents is first aired on Page 158 in DVC, and Page 175 in DoG/DVL. The 'explosive' secret these documents contain is first aired on Page 239 in DVC and Page 226 in DoG. The expert — whose murder launches the quest to find the documents is murdered on Page 11 in DVC and 15 in DoG. The fact that the hero and expert are acquainted is mentioned on Page 22 and Page 15 respectively. And the fact that the dying expert wrote a message in his own blood, is mentioned — in both books — exactly on Page 35. 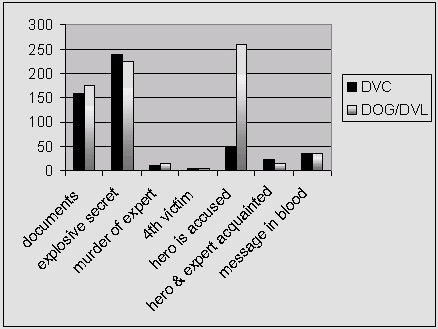 The only difference as far as sequence in the above plot line is concerned, relates to when the hero is accused of having murdered the expert. In DVC it happens early, Page 47, while in DoG it happens later, on Page 260: but the point is, it happens in both books. So we have 7 identical plot features out of 7 across both Brown and Perdue, of which 6 are in sequence. But, to put the above in context: this is only a small part of the striking similarity of plot, characterisation, and expression of narrative across the two authors. Two further, striking, examples of this degree and depth of similarity can be found if we study the characteristics of the hero and the heroine across the two authors. In each book we have a hero and a heroine. There is, of course, nothing unusual about this, except that there are very close parallels between the hero of Brown's book (DVC) and Perdue's book (DoG), as there are between the heroines. The heroes are of the same age group, and follow identical occupations in that they are both professors in religious subject areas at very prominent universities (comparative religion [DoG] vs religious 'symbology' [DVC]), and whereas Perdue's DoG hero is an expert in the Roman Emperor Constantine and female divinity with Perdue's other book the Da Vinci Legacy's hero as a Leonardo scholar, Brown's hero is not only a Leonardo scholar but also an expert in the Roman Emperor Constantine and female divinity. Thus we have a 100% match between Brown and Perdue with respect to occupation and areas of expertise (which even in real life would be stretching co-incidence as frequently academics within the same discipline will have slightly different areas of speciality and not a perfect match, as in this instance). In addition, both are showing signs of ageing as the novels open, read ancient Greek, are 'captivating' on the 'podium' (Brown) or have a smile which 'captivates' at the 'podium' (Perdue), are haunted by lost loves — in Perdue the hero has a "hollow void in his chest", whereas Brown has "an unexpected emptiness in his chest". By the end of the book each hero gains (or regains) the love of the book's heroine. The hero of DVC shares a further interesting characteristic with that of DoG: both have claustrophobia, or to be precise 'mild claustrophobia'. As mentioned above, in each of the books the hero is falsely accused of murder, against the background of each needing to fulfil the quest of the narrative, which is to locate documents relating to a female deity, either through the Holy Grail documents, or the Da Vinci Codex, or the shroud of this female deity. In carrying out this quest the hero has a further motivation, which is to protect the heroine. The checklists below summarise the impressive range of equivalences between Brown's and Perdue's heroes. List 1 consists of plot-centric striking similarities, while List 2 consists of further similarities. As the reader will observe, the above lists demonstrate unambiguously the identical parallels between the two writer's heroes. The heroes of the two writers share six plot-centric characteristics out of six, and there are four out of four parallels across the above set of less crucial, but still important, personal characteristics and outcomes between the two authors' principal male characters. Their uncannily similar childhoods (raised by male figure after family tragedy) as well as educational, career and academic interest parallels: educated in two languages and two countries, work for law enforcement agencies, interests in religion and art; both characters are resourceful and plucky, have a strong interest in and skill with cryptology/forgery, etc. Like the two heroes, the heroines of the two authors have many striking similarities and many identical points. In DoG Zoe's hair colour is not specified, but her predecessor in The Linz Testament had auburn hair: in DVC Sophie Neveu's hair is 'burgundy'. Sophie, like Zoe's predecessor has 'flashing green' eyes. Both women are either 'ample' of figure, or 'robust': they are not the typical slim heroines found in many books and films. All the heroines are in the same age group, late 20's to early 30's. Just as with the heroes we have in the heroines, characters of very closely matching characteristics. In DoG we have Zoe Ridgeway who is an art broker whose expertise includes forgery detection and whose major interest is religion, whereas in DVC we have Sophie Neveu, a Paris police officer part of whose job is cryptography and she, like Zoe, has a major interest in religion and, also like Zoe, expertise in art. It should be noted that Perdue's earlier book DVL has the art journalist Suzanne Storm, who in fact is an undercover CIA agent. So, the main characteristics of Brown's heroine with regard to occupation and areas of specialised interest are identical to those of both of Perdue's heroines, with particularly suspect areas of co-incidence being their work for law enforcement agencies, an expertise in art and an interest in religion. More detailed information is available here. The origin of Perdue's Zoe Ridgeway is given by Perdue in DoG as the goddess Sophia of the Gnostic Gospels. In fact, the actual daughter of the Sophia of the Gnostic Gospels was called Zoe. Therefore, Perdue's heroine is symbolically the daughter of Sophia. Brown's heroine is called Sophie Neveu who is said to be a descendant of Mary Magdalene, the alleged wife of Jesus Christ. Mary Magdalene, in the Gnostic Gospels (also the source for much of Brown's research) is actually a stand-in for the Sophia of the Gnostic Gospels, according to well-known writer Margaret Starbird (whom Brown admits to having consulted): "In long-standing tradition, it was she [Mary the Magdalene], understood by early Gnostics as an incarnation of Sophia, ...." (Magdalene's Lost Legacy, p. 125, Starbird). In other words, Brown's heroine is the lineal (rather than symbolic) daughter of Sophia. In both Perdue's and Brown's books, the goddess Sophia has been wronged by the church authorities who have deprived the goddess of her rightful position as an official deity in the church. The quest is to obtain access to the 'explosive' (both authors) documents which prove the link between Christ and the female goddess in each case, and thus demonstrate the inviolable position of the female deity in the church, and re-assert the 'sacred feminine' as the core of religion. The ways in which these documents are hidden, the people who protect them, and the ways in which they come to light, are remarkably similar across both books. These striking parallels will be explored in greater depth in subsequent analyses. While the plot sequence is certainly a smoking gun there is, in this analyst's view, one even more powerful smoking gun, which is a document known as the Codex Leicester, an actual book written by the Renaissance scientist and artist, Leonardo da Vinci. The codex Leicester is written on linen paper, but Perdue erroneously records this as 'parchment' in his book — an error which extensive researches (across the Internet, as well as other sources) do not uncover as occurring elsewhere. In his book Brown repeats this error. There is, to my knowledge, no other mention of the Codex Leicester being on 'parchment' anywhere else other than in these two authors' books. Therefore, it does not seem feasible that Brown could have got this particular misinformation anywhere else than from Perdue. These critical documents are obtainable by use of a very special "key"
In each case the key is given to the heroine through a curator of art, and the key is hidden in or behind a painting, each painting (on wood in each case) contains in its title the word Madonna or Our Lady. The relevant containers which the keys (indirectly, technologically) unlock are held in banks which themselves are located in Zurich or in banks which have a direct connection to Zurich. It goes without saying that the possession of the key is what gives the heroine (and hero) in each case right of access or passage into the bank, or contact with the bank's officials, who then facilitate the process of opening the vault containing the deposit box which contains the further elements in the puzzle. The documents referred to in the previous sections contain information which is so 'explosive' (actual word used by both authors) that, across both authors, it could have devastating consequences for the future of the Catholic Church. For this reason, as the regular reader of thrillers will appreciate, there is a complex web of narrative material surrounding the announcement of the documents, the quest for their location and their final uncovering. What is remarkable is the degree of striking similarity across both Brown and Perdue with respect to this 'web of narrative material', as I have termed it. In Perdue's DoG there is a golden key which is hidden in a painting (The Home of the Lady of Our Redeemer). This golden key (accompanied by a gold ingot with the account number) allows access to a safe deposit box in a Zurich bank. The key does not actually open a lock as such. In Brown's DVC there is also a golden key, which is hidden — not in, in this case, but behind — a painting (Madonna of the Rocks). This is a laser-cut gold key allowing also access to a safe deposit box in a Zurich related bank. Just as in Perdue's case, Brown's key doesn't actually turn an actual lock either. Interestingly, both paintings in both sets of novels are painted on wood (in general — but not always — this tends to tie paintings to particular periods and particular regions, because wood was mostly supplanted as a painting ground by canvas). In DVC Sophie finds the key hidden behind the painting while she and Langdon are in the Louvre. The reader will know that at the beginning of the novel we have the Louvre curator being murdered by a member of a secret brotherhood. This dying curator leaves a written message, which he writes on the glass that covers the Mona Lisa. This message tells Sophie where to locate the key which, as mentioned above, is concealed in the same room, secreted behind the painting Madonna of the Rocks. The curator was actually Sophie's grandfather. In DoG there is also a triple connection between the painting, the heroine and the curator: DoG's Zoe, the heroine is sent the painting (which contains the key) by Max (the curator) who, as it happens is also killed by a member of a secret order. In DVC Sophie finds the key and is baffled by it, because she has no instructions about what she is to do with the key, mainly because it does not look like a 'normal' key, but rather a kind of cypher. The key in DVC is made of gold and contains a series of laser-cut pits and reliefs. It is also designed to be read by a laser. It first allows Sophie access to enter the car park and then the building of the bank. Previously I described this as a 'Zurich related' bank. What I meant by this is that the bank is in fact the Zurich Bank of Commerce in Paris. Unlike DoG, the bank is not located in Zurich, but the Zurich connection is there. Finally, in DVC, the key controls a computer operated device which gives the protagonists access to the safe deposit box which contain the documents — the details of which I will explain below, and which will be seen (as with the other aspects of this plot line) to have many resemblances to Perdue's work. In DoG, Zoe — as mentioned above — is sent the painting. She and Seth go to the person who owned the shop where the painting was framed and in the course of this conversation, they learn that if they take the painting to a particular bank in Zurich they will have access to an important safe deposit box (as mentioned before, the key is embedded in the painting). (Perdue's painting is by a real artist but is not a real painting — the title plays on the iconic value of the words 'lady' and 'redeemer'). In Brown's book the reference is to an actual painter, Leonardo, who painted two versions of Madonna of the Rocks on wood, one of which is in the National Gallery, London, with the other in the Louvre. Perdue's key requires removal, along with the gold ingot, from the painting. The gold ingot contains the account number and is also used as a counter balance to open the vault which contains a box which in turn has to be decoded in order to reveal the secret 'explosive' documents. In Brown's case the pitted reliefs and impressions of the golden key actuate a somewhat intricate technological device, which delivers a safe deposit box. This in turn contains a box which holds a carved wooden puzzle where the dials have to be set to the correct combination for the puzzle to open. In Perdue's case the safe deposit box contains a briefcase with a combination which also has to be set properly. The key point is that each narrative utilizes a key which is not a conventional key to open a safe deposit box which contains another container which has to be decoded to reveal a secret — which secret, as it happens, relates to the actual divine nature of the female goddess as an integral deity of the church which the church in turn has attempted, through a secret brotherhood, to suppress, partly through murdering — in each case, the curator of a museum. What is inside the containers found in the safe deposit boxes is information that sends the protagonists in each of the novels on the next leg of their quest. In both cases this is to another country. In Brown they are taken from Paris to London, while in Perdue the protagonists are taken from Zurich to Salzburg. In both cases the ultimate documents are supposed to be at the destination. In Perdue's case the hero and heroine get to the documents, but in Brown there is another red herring. In Brown's case the documents are not found, but in Perdue's the documents are destroyed. the fact that Brown's book — which has the demonstrated (and other) striking similarities referred to here — has virtually the identical title to one of Perdue's earlier books, mentioned above, namely the Da Vinci Legacy (we understand that while titles in themselves are not copyrightable, the courts have held that where titles are identical or similar, textual and other striking similarities may as a result be included as ancillary evidence of infringement). I believe in this document I have given significant evidence of the overwhelming infringement of Mr Perdue's books by Mr Brown. Given more time for research, further outstanding parallels between the authors will be documented.